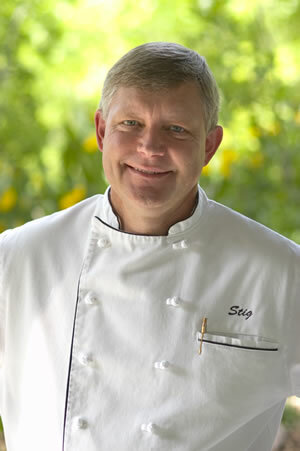 Stig Hansen is an award-winning professional chef and recognized authority on Danish cooking. Born and raised in Denmark, Stig Hansen has been around great Danish food all his life. With a mother that really knows how to cook, he was inspired to be in the kitchen at an early age. She always encouraged her children to cook. The rule of the kitchen was if one of the kids cooked a meal that was good enough for the family, she would do the dishes. Right out of high school, Stig started as a chef’s apprentice with Lauritzen Shipping Line. After culinary school, he apprenticed on board world-wide sea going freighters cooking traditional Danish food for the crew members. He furthered his training and experience by working at first class hotels in Copenhagen and Greenland. After graduating from the Danish State Culinary School, he spent two more years on board ship, cooked for the Danish Navy and then immigrated to the United States. His work has taken him to several US states; working at the legendary Scandia Restaurant in Los Angeles and at Nendel’s Inn in Portland, Oregon. At Nendel’s he began an eight year tradition of the annual Danish Week, celebrating traditional cooking for the large Danish community.